Zombies Slot is another exciting post-apocalyptic video slot powered by NetEnt. If blood, half-eaten brains and homemade weapons don't scare you and you think you have what it takes to survive a Zombie invasion, then this might be the slot for you! With both random wilds and stacked wilds, free spins round, a zombie shooting range and a jackpot of 100 000 coins. This game has everything you might want when playing slots online. The backdrop and sound effects are truly scary and the added animation of zombies jumping on your screen and screaming will probably make your heart skip a beat! 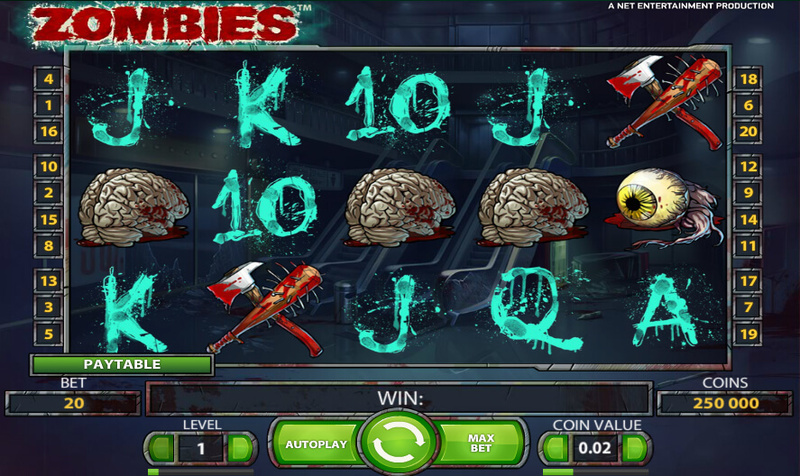 Zombies slot has 5 reels and 20 paylines with a scary theme, but a lot of extra features that make it worth playing. With a Scatter, stacked Wilds, random Wilds, free spins and a bonus round, you have all the ingredients for a fun and rewarding gameplay. All bets are adjustable, with coin sizes ranging from 0.01 to 0.5, and the option to play between 1 and 10 coins per line. At 97.2%, the RTP (Return To Player) is rather good, and thanks to a 10x multiplier in the bonus game, the jackpot can go up to 100 000 coins. Lower value symbols are nothing new, with playing cards from 10 to Ace that has payouts from 70x to 120x for five of them on the reels. Higher paying symbols include a chainsaw, a gas mask, a brain, an eye and an ice pick, and have payouts from 400x to 1000 for five of them. Zombies Slot can be played on mobile but to get the true experience, it is recommended to play on your computer with the volume on! You need three Scatters on the reels 2, 3 or 4 to activate the free spins. It awards you five spins that can be re-triggered. On top of that, the free spins benefit from an increasing multiplier. The first one is just 1x, then 2x for the second spin, third 3x, fourth 5x and the fifth and last spin gets a 10x multiplier. The stacked Wild feature cannot appear during those rounds. 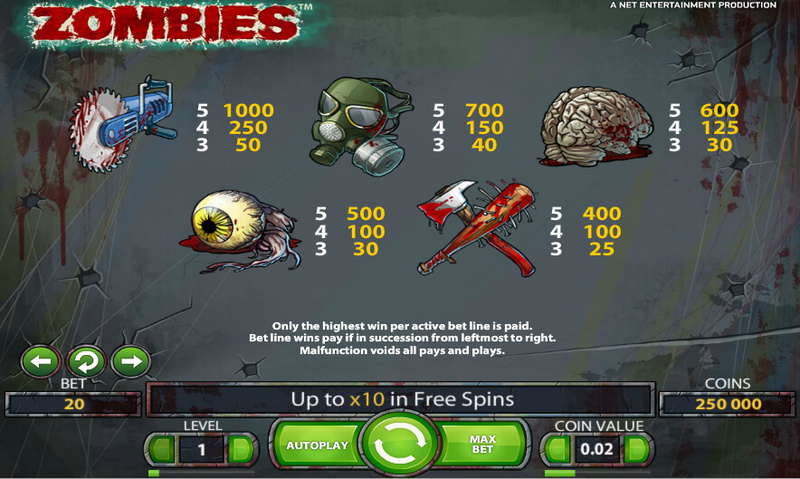 During the free spins, you also have access to a bonus game where you have to shoot Zombies. Each Zombie you hit awards you coins. The amount depends on the bet level you were playing. Another bonus is the Random Wild feature that can be triggered after any spin. 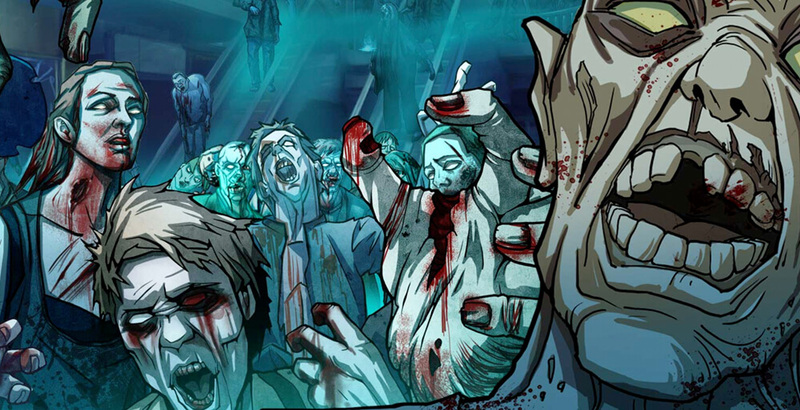 In this feature, a Zombie will jump on your screen and scream, so be prepared! Up to 6 symbols can be changed into Wilds, awarding you more wins. What's a great slot without a great jackpot! The maximum you can get is 1000 coins for five chainsaws on the reels. Neither the Wild nor the Scatter has payouts. But with up to 10 coins per line and a very generous x10 multiplier in the free spins, that jackpot can go up to 100 000 coins! instant play or download the software onto your desktop computer, this is the place where you can find all this information. We review slots, progressive jackpots and table games to find the best of the best and recommend them to you.